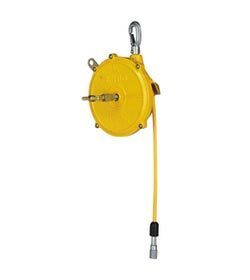 We hold the expertise to offer a range of Air Tool Balancer. We meet the customized specifications of the customers being a Supplier, Exporter and Importer. Rest assured of its excellence as we provide export grade quality. Lay your hands on excellence for reasonable rates. The tool balancer takes away load from operator and reduces fatigue thereby helping increase productivity and tool life. Contact us to avail the lucrative prices. 3 kind of model employ 3 kind of hose respectively. They will play their active part with the particular features. These models are combined with both the character of Hose reel and balancer and will suit the suspension of an air tool. They enable it to put the piping of hoses in order. This model is gathered the ability of hose reel and spring balancer. Using this balancer would make work places simpler.